Most people who know me know that I’m a “foodie.” I love food. I think about food a lot. I’m usually thinking about my next meal before I finish the current one. Yeah, I love food. So, how are we doing? I’m happy to report that we’ve been incredibly successful thus far. Granted, we’re only one week into the October Unprocessed pledge, and it’s natural to expect that a bump in the road will occur sooner or later, but we’ve already learned so much. Most importantly, our food choices through the rest of the pledge and beyond will be much more informed … the knowledge we’ve gained is truly priceless. One of my favorite parts of our October Unprocessed journey so far has been experimenting with new recipes … and I’m pleased to be sharing my latest recipe success with you today. 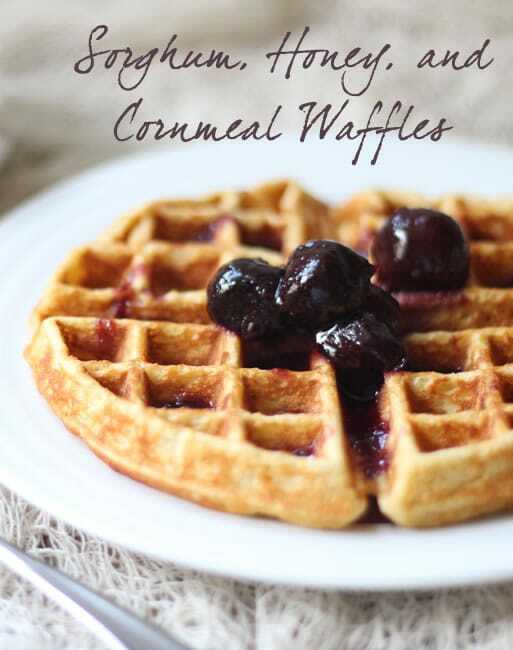 My husband and I are big fans of breakfast so experimenting with an “unprocessed” waffle recipe was at the top of my list … and I think my sorghum, honey, and cornmeal waffles will satisfy even the biggest breakfast lover’s appetite. Topped off with my two-ingredient homemade syrup, you have an “unprocessed” breakfast winner! 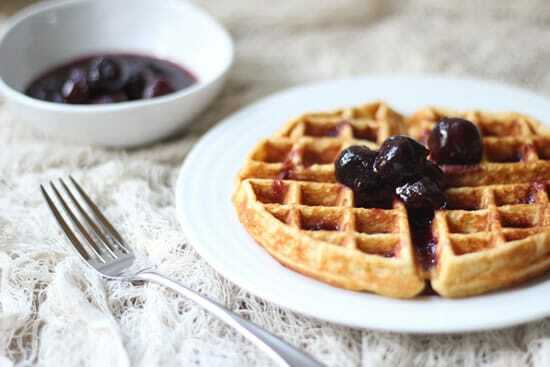 Classic way to start the morning off with delightful waffles that are perfect to hold you for the day to come. Preheat waffle iron on highest heat setting. In a large bowl, thoroughly whisk together the flours, cornmeal, baking powder, and salt, making sure everything is evenly distributed. In a medium bowl, whisk together the buttermilk, eggs, and honey. Pour the wet ingredients over the flour mixture, and whisk gently to combine. Some lumps are okay; do not overmix the batter. Gently fold in the melted butter until just combined. Pour 1/2 to 3/4 cup batter into the center of waffle iron (depending on the size of waffle iron), spreading batter to within 1/2 inch of the edge. Close waffle iron, and cook waffles for 2 to 3 minutes, until golden brown. Serve warm with syrup and butter as desired. I used Bob's Red Mill unbleached/unbromated white flour, sorghum flour, and cornmeal for this recipe. Additionally, I was able to find buttermilk and butter that contained only ingredients that pass the kitchen test, but I had to read quite a few labels first so be sure to read the labels too! This is the perfect topper for morning waffles and it is a super easy recipe! Place frozen fruit and preserves in a medium saucepan, and stir to combine. Place pan on stove, and over medium-high heat, bring the fruit mixture to a boil, stirring occasionally. Once mixture boils, reduce heat to medium-low, then cook until fruit mixture thickens, again stirring occasionally. 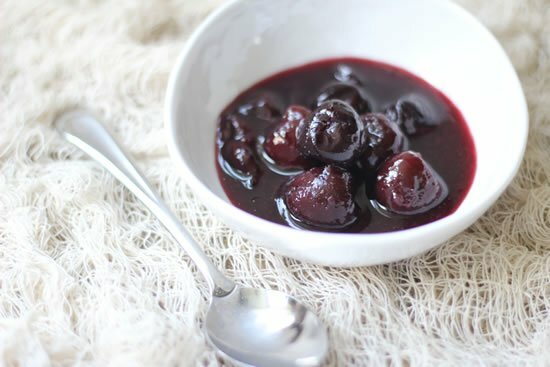 I used a combination of dark sweet cherries and blackberry preserves in my version of this recipe; feel free to play with any fruit combination you like ... the possibilities really are endless. Additionally, you can mash the frozen fruit into the preserves or even process with a stick blender if you prefer a smoother syrup. Finally, I had to read a number of fruit preserve labels to find one with ingredients that pass the kitchen test, but it is possible! Thanks so much to Andrew for allowing me to guest post for October #Unprocessed! Loving this challenge so much! Kimberly- thank you for sharing your story. I relate to your food orientation. I am mostly a clean, healthy eater, but I too have some old family favorite recipes that I can’t let go of. I love those recipes for holidays especially because they’re so full of memories. I feel I don’t have to be perfect all the time, and I got that same feeling from what you wrote. I look forward to seeing more of what you have on your blog. Good luck with the challenge. Yes, the family recipes we make at the holidays are so filled with memories … and I don’t feel guilty about eating them at all! Looking forward to checking out your site! Isn’t cornmeal made from corn and isn’t most of the corn in this country GMO corn? Almost all corn is GMO and isn’t cornmeal made using this corn? I think your statement is probably 99% true for most cornmeal bought at commercial grocery stores. I used Bob’s Red Mill cornmeal for this recipe, and all of the Bob’s Red Mill products come from non-GMO seed so this one is safe. Love that you found Eating Rules through my guest post, Laura!